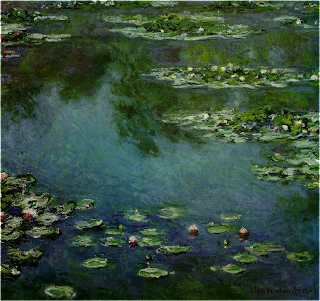 Monet spent the last thirty years of his life painting waterlilies in different compositions, a series of 250 paintings. He recreated himself thorough the same motif over and over again. 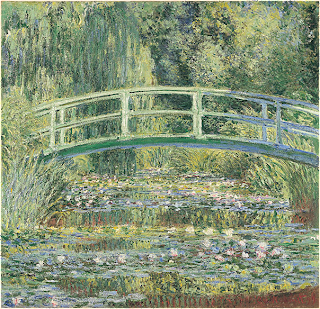 The pond for aquatic plants with the Japanese bridge in the paintings did not exist till Monet built it himself on the land next to his home in Giverny. He wrote to the town for permission "...to build this garden as a pleasure to the eye and as a motif to paint." In the earliest of these paintings, Monet used a traditional composition with the bridge, a point of view where the viewer would would be standing at the edge of the pond looking out into the depths of the landscape that is blocked off in the distant by trees. By 1906 he was not so concerned with the landscape and he did not even incorporate the bridge, he just painted the waterlilies and their reflection in the water. There was no horizon and the viewer would be hovering over the pond, seeing the sky reflected on the water as well as the depths of the water. 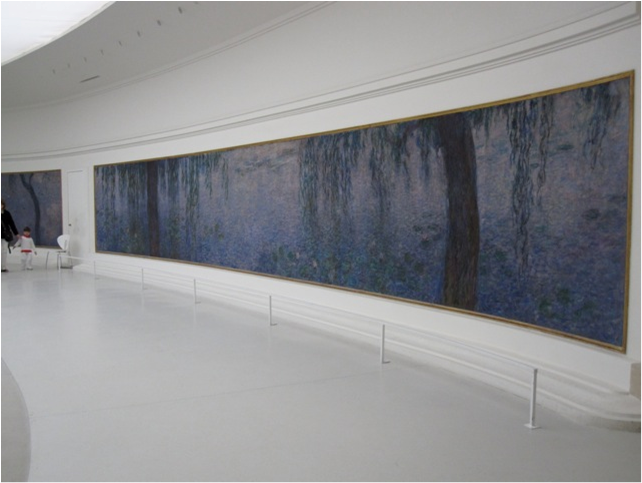 In some of the paintings, the reflections of the willow trees can be seen on the water's surface. When looking at the garden that is setup to look exactly as it was in Monet's paintings, it is easy to see these were accurate representations based on Monet's visual experience. By this time Monet was a very famous and respectable artist and had many friends who came out to visit him in Giverny. Also an artist's colony had come into being in the area, full of painters who wanted to meet Monet and paint his garden. He associated with only people of his choice and this gave him the reputation of being a hermit. He was the architect of his public and private life as well as his landscape. 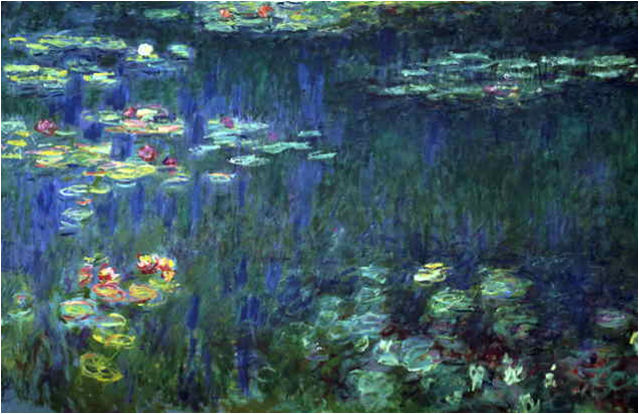 Monet was an avid botanist who constructed his own landscape in order to recreate it in his paintings. In order to integrate the viewer into the paintings, Monet stared to think about scale. His paintings got bigger to 6' x13'. The viewer was brought into the landscape like they were hovering above the lake. He wanted to create a meditative experience where the viewer would be engulfed by the paintings. His dream was to build an architectural space to install his series as a series. He worked on 40 panels with 8 compositions. He built a new studio where he could assemble sliding easels. He called this project Grandes Decorations. He conceived them as a group, painted them as a series and worked on them bit by bit building them up and reworking them until he captured effects he wanted. Monet used a lot of complementary colors he loved from his earlier paintings in these panels. 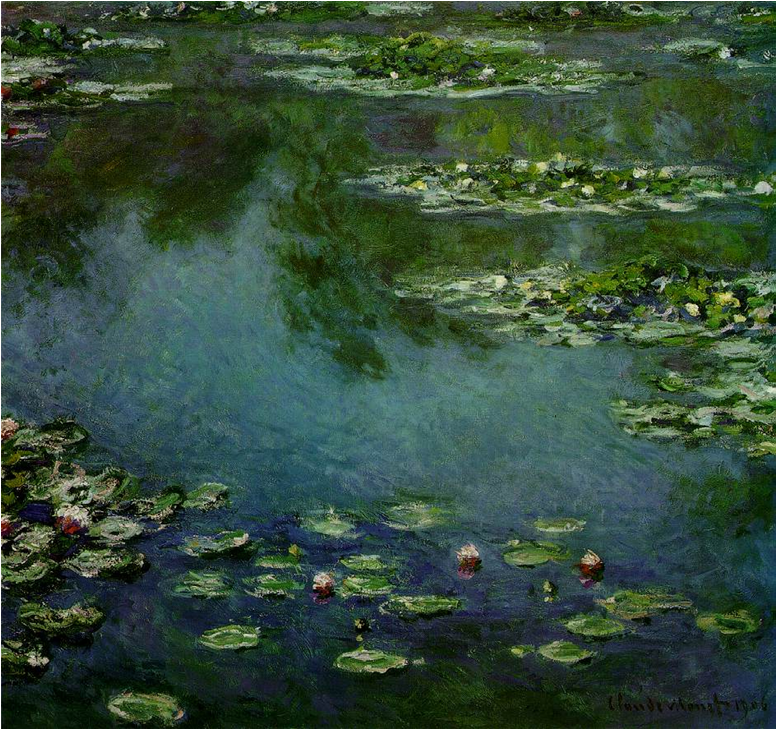 The brushwork defined the subjects he painted; while clouds were dissipating swirls, the waterlilies were solid colors. His work from this time is considered to be the beginning of abstraction post World War I. He had cataracts and some people attribute the abstractness of the works to his eye problems. The French government bought his panels to install in the Musee de l'Orangerie in two circular rooms with skylights, hung relatively low. 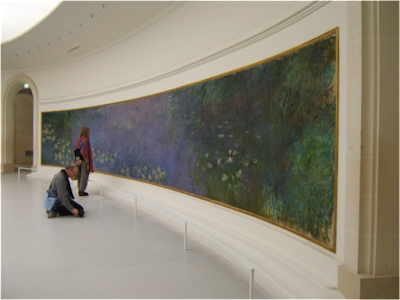 Monet died before seeing his panels hung low and directly on the curving walls according to his wishes. "I was once briefly tempted to use water lilies as a sole decorative theme in a room. Along the walls, enveloping them in the singleness of its motif, this was to have created the illusion of an endless whole, of water without horizon or shore. Here nerves taut from overwork could have relaxed, lulled by the restful sight of those still waters, and to whosoever lived there, the room would have offered a refuge for a peaceful meditation at the center of a flowering aquarium. Imagine a circular room, the dado below the wall molding entirely filled with a plane of water scattered with these plants, transparent screens sometimes green, sometimes mauve. The calm, silent, still waters reflecting the scattered flowers, the colors evanescent, with delicious nuances of a dream-like delicacy." actually my name is janeene browne blank. notice the e at the end of brown. it is not pronunced as brownie, a favorite desert. i am also a montague, so have known about lady montague for a number of years. she was responsible for bringing the idea of vacination, in this case, for smallpox, back to europe, from turkey. i just discovered your web site today. as an artist and art historian i can say it is incredible! i almost got kicked out of grad school for my addiction to classical, and neoclassical art, especially the works of j.l. david. of course i was right and they were wrong. one of my favorite david's is a'marrat, and i actually am a distant cousin of charlotte coudray, being an anglasized cowdray.